For taxpayers who have suffered a credit report hit of up to 200 points on their FICO score due to a federal tax lien, the IRS "Fresh Start" program now allows many taxpayers to have their federal tax lien completely withdrawn from the credit agencies, reports Atlanta CPA Firm, Thompson & Associates CPAs, LLC. This new initiative by the IRS is designed to assist taxpayers who are struggling with tax debt and desire to improve their credit worthiness. “For many taxpayers, the ability to remove a tax lien from a credit report may be the difference between qualifying for a loan or not”, according to Christopher Lee, Atlanta Tax Attorney with the firm of Bomar & Rice, LLC. For taxpayers who have suffered a FICO credit report hit of up to 200 points due to a federal tax lien, the IRS may be able to help. In the past, even after tax debts were paid, a federal lien would still show on a taxpayer’s credit report and cause damage to the taxpayers credit score, according to Atlanta CPA Firm, Thompson & Associates, CPAs, LLC. Under the recently enacted Fresh Start Program, the IRS now allows many taxpayers the ability to completely remove the lien from their credit report, This new program not only allows taxpayers to remove the lien and drastically improve their credit score but it also creates easier ways to repay tax debts owed to the IRS. “For many taxpayers, the ability to remove a tax lien from a credit report may be the difference between qualifying for a loan or not”, according to Christopher Lee, Atlanta Tax Attorney with the firm of Bomar & Rice, LLC. This new program is great news for taxpayers since consumer’s credit reports can now be quickly repaired. In the past, taxpayers could pay the full amount of tax owed and mark the lien as “released” on the credit report but still had to wait seven years after the date the lien was satisfied for it to be removed from their credit report. Under the new guidelines, liens can be removed once full payment is made or in many cases once the taxpayer enters into a direct debit installment agreement with the IRS. Taxpayers who are already in a monthly payment agreement can easily convert to a direct debit installment agreement and request removal of the lien. Once the taxpayer is on a direct debit agreement, they must make three consecutive monthly payments before the IRS will consider lien removal. The taxpayer must have filed all required tax returns for the last three years and must not have defaulted on a previous IRS installment agreement. Additionally, to qualify for this program, the total balance owed to the IRS including tax, penalties and interest must be less than $25,000. 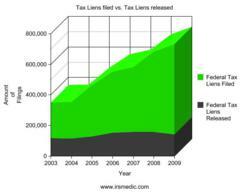 Getting the IRS to remove the lien is just the first step in a taxpayer improving their credit. While the IRS may withdraw the lien and mark it satisfied with the court where the lien was filed, it is the taxpayer’s responsibility to notify the credit reporting company once the lien withdrawal has occurred. In most cases, neither the IRS nor the court will notify the credit agencies when a lien has been withdrawn. As a result, the time to get the lien withdrawn can take 90 days or more. The IRS has also expanded its existing installment agreement options to allow more taxpayers to participate. The “Streamlined” Installment Agreement allows taxpayers to pay the tax owed in equal monthly payments over a set amount of time. Historically, this type of installment agreement allowed taxpayers whose tax liability was less than $25,000 to make monthly payments over five years. Under the new program the IRS increased the limit to $50,000 and now allows taxpayers to pay the balance owed over six years as long as the taxpayer agrees to make direct debit payments and the statute of limitation for collection exceeds six years. Other changes under the Fresh Start program includes the IRS lessening the impact of its lien practices by increasing the threshold for filing a lien against most taxpayers from $5,000 to $10,000. Whether a taxpayer has satisfied their lien, is already in an installment agreement or has not attempted to establish a payment plan with the IRS, the best course of action is to contact their tax advisor to find out whether they can take advantage of this new program and improve their credit. A full report of the benefits of the IRS “Fresh Start” program can be found at http://www.atlantacpas.com/Latest-News.html. About Thompson & Associates CPAs, LLC. Thompson & Associates CPAs, LLC. is dedicated to helping companies protect, preserve and enhance enterprise value against increasingly complex economic, legal and regulatory environments. In addition to tax and accounting services, the firm provides valuation and investigative services to clients facing internal fraud, business damages, litigation, bankruptcy, financial distress, or cash flow difficulties.